Morpheme Bacopa (Brahmi) contains pure 500mg extract of brahmi herb. 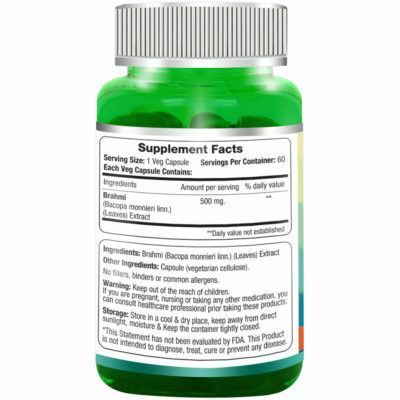 Serving size: 1 Veg capsule Servings per container: 60 Each 500 mg capsule contains: Brahmi Extract Each Bottle Contains: 60 Vegi Caps Suggested Usage: 1 Capsule twice daily after meals. Other Ingredients: Capsule(Vegetarian Capsule), 100% Vegetarian. No Fillers, binders or common Allergens. Morpheme Brahmi capsules contains the extract of pure and potent brahmi. The product provides all the benefits of the herb. It is ensured that the herb reaches the consumers in its purest form. The processing is done using high-tech technology. The product is beneficial for treating a large number of diseases.